It works with any app that supports drag-and-drop, and helps keep you focused by letting you quickly set something aside, without having to consider where it needs to be dropped, or having to constantly switch between apps. 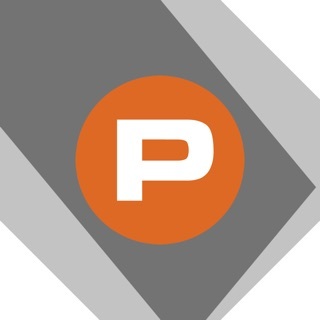 • Works with any app that supports drag-and-drop, but also provides an extension for apps that don't yet support it, as well as the ability to paste items to & from the clipboard. 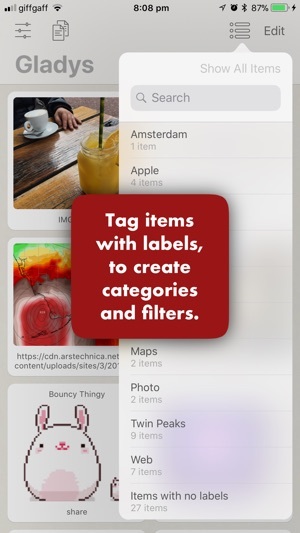 • Quickly search for items inside the app or via Spotlight. Access your top items from the home screen / Today widget, your Apple Watch, and even iMessage. 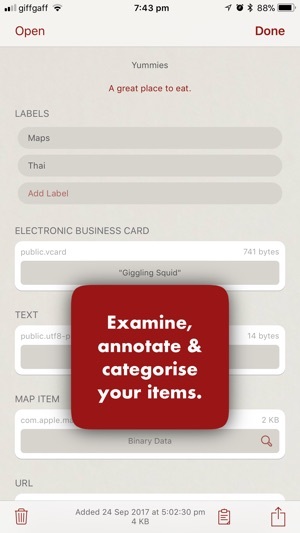 • Annotate items with notes, custom titles, and tag items with labels that allow you to easily categorise, browse, and sort your collection. 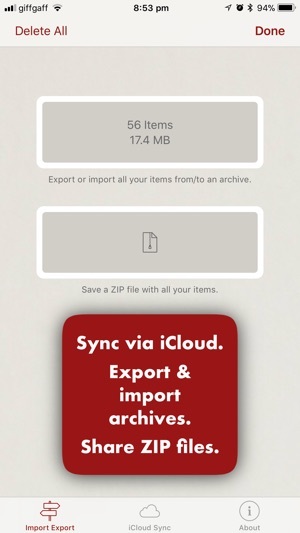 • Take your collection with you on your iPhone, and keep it updated by turning on automatic iCloud syncing. 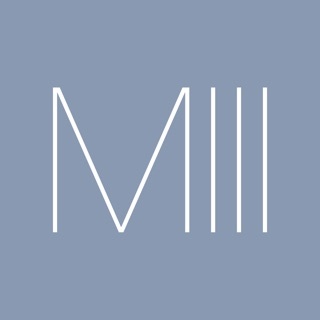 • Invite friends to keep items from your own collection in their own collections, and, if you give permission, even collaboratively annotate and edit them. • Import/export/merge collection archives simply by dragging. • Ideal for bookmarking between apps: For example you can quickly return to dropped email items by selecting 'Open' in their info view, quickly share links between different browsers, or use Siri shortcuts to copy often-used items to and from your clipboard. • Experienced users can get details on dropped items and extract or modify specific data components (e.g. 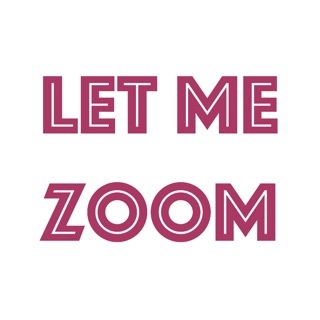 extract the URL of an image link, instead of the whole item, add a new image, or edit the title). • Power users can use Gladys' Files extension to view/edit items in-place from other apps, as well as exporting all items in a ZIP file for sharing. • Technical users can inspect binary data using the in-built hex viewer, download items pointed to by web links, and even archive web pages. • Contains no analytics, ratings prompts, or noise. 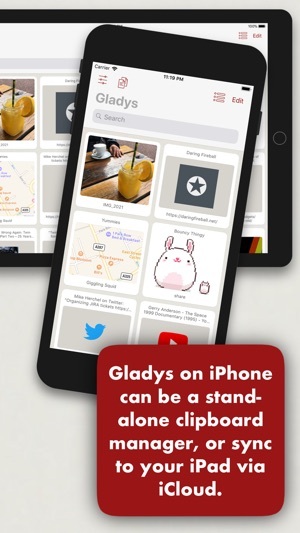 Gladys is free for casual use (up to 10 simultaneous items). Power users with larger libraries can expand Gladys to hold unlimited items with a 99 cent in-app-purchase. This update works around a recent iCloud issue which could lead to Gladys deactivating sync automatically in order to protect user data. ORIGINAL: Not sure what the use case is for an external shelf app that doesn’t provide enhanced accessibility to files. You can’t do anything “extra” with this app—old limitations still exist. EDIT: The developer’s response to my original concern is appropriate. I’m probably trying to place square pegs into round holes with my specific use case. Rather than rate the app one star because it doesn’t solve my needs, I am modifying the rating to the app’s current average score to avoid unfairly penalizing the developer. Hi! Gladys has no limitations on what apps it will accept or provide data to. It's far more likely that the apps you mention do not support drag and drop, or at least not for the functionality you are trying to access. However, you can still transfer data from other apps using the share extension and the good old-fashioned cut-and-paste clipboard! Hope this helps. Also, I'm always open to suggestions and how to improve the app, just email me at the address provided in the about view. 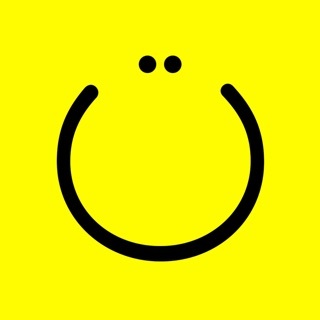 Amazing app and equally awesome support! This app blows the several others I tried out of the water. And for $0.99 nonetheless! Yes, unlimited usage for 99 cents, most other apps with the ability to do what Gladys does costs far more and works far worse than Gladys. Better yet, I was having an issue restoring my purchase and Support got back to me within minutes with the commitment to work with me to get the problem fixed and a list of steps to troubleshoot with. And problem solved minutes after! Very rare to find a great app, for 99 cents, with great support, and still be low-key enough to not be a popular app in the App Store. I don’t write reviews on many apps (I’ve written like 2), but this one is warranted. After less than a week of use, Gladys is already one of my *all-time favorite* iOS productivity apps. 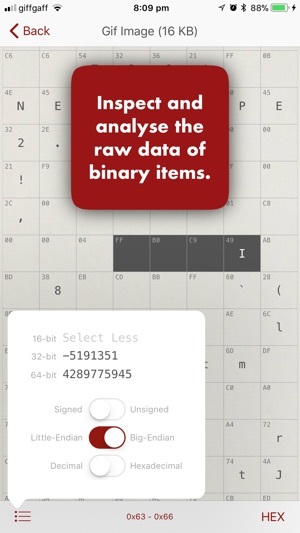 The app is deceptively simple; the potential use cases in the era of iOS drag-and-drop are immeasurable. On my iPad, the functionality of Gladys already “feels” like a “natural extension” of iOS multitasking. IMHO, Apple should acquire this app.